Wow - wonderful book! Great ideas for how to get better at acting according to our knowledge and testimony. This book doesn't have all the answers - it gives tools for getting all the answers. The book also comes with a DVD that is a recording of Elder Bednar meeting with a small group of people who asked questions about the material in the book. I highly recommend taking time to watch the whole recording after you've read the book! After each of the four chapters, several pages are included that have prompts for more personally applying and learning about the principles. For example - there is a page where you can write scriptures that help teach about the topic, and another page where you can write what you can do to improve and how you will know if you are improving. At the end of each chapter, Elder Bednar also gives information for two additional talks that help teach more about what was discussed in the chapter.Basically, Elder Bednar didn't write a book to tell us how to act in doctrine; he wrote a book motivating us to want to act in doctrine and then gave us the tools necessary to do so. Not just a book; a study aid with the potential of changing lives. Thick, and mostly cerebral, this isn't a quick read. One story from the book best of all exemplifies the book as a whole: in an area seventy conference Q&A session, someone asks President Packer "will you please tell us what you've learned about the atonement?" President Packer replies, "Read the Book of Mormon as many times as is practical on the next three months and write a one-page essay on what you learned about the atonement. Next question." The questioner was hoping to download President Packer's knowledge and thus avoid the arduous task of learning for himself. Unfortunately, the answer was "you have to put in the work to get the result you're REALLY looking for." That lesson seems to apply to the book as a whole. I think that if you agree that a lot of the Apostles have particular themes that they like to hit on in their talks again and again, then there would be a good argument that Elder Bednar's theme is learning in faith. He has spent a lot of time talking about how to learn and how to teach gospel truths. This book is a follow up to his first "Increase in Learning" and seeks to answer the question that I have pondered many times: How does one effectively transform what we know into what we do? I think this is a quintessentially religious, and especially Christian, concern. In the Bible, followers of Christ are admonished to "take [the yoke of Christ] upon you, and learn of [Christ]" in order to "be ye therefore perfect, even as your Father which is in heaven is perfect." While the first may be in some ways easy, learning of the characteristics of Christ and his doctrines, applying them in our lives requires us to cast off our natural tendencies to align ourselves more with His will. This is, we believe, the work of more than a lifetime, but is also something that we have to strive for everyday. In this book, Elder Bednar outlines a few principles he feels will help us close the gap between what we know and what we do. There are several links to video segments of Elder Bednar with a group of people, as well as suggested further readings at the end of each segment. There are also questions and space (digitally and on paper) to write our own responses and thoughts as we think how we can improve and be more Christ-like. I liked this book for several reasons; it is short and acts more as a springboard to our own further study, as opposed to being the answer to all things. There is an interesting anecdote in the book in which a new member to the Church asks Elder Bednar a question, to which he declines to answer directly and instead points the questioner to scriptures where he would be able to find his own answer. The man was initially very disgruntled with the response, but did as he was advised and was able to find the answer for himself. I think this book is, in a lot of ways, the same. It is a starting point, but Elder Bednar, as he often talks about, leaves a lot of responsibility on the reader to study further and come to their own answers. While this is a follow up to his first book, he explicitly states that it is intended to stand alone, and it certainly does, but I also want to go and read his other book. This was inspiring and has led to me pondering and re-evaluating my own dedication to following the example of Christ. With the new focus in study and teaching this book is a great asset. Elder Bednar sends you on a journey to discover the answers to your questions and to creating an environment to help others ask questions to discover for themselves the answers they may not even know they were seeking. This is a book that will be a companion to my study for years to come.With the new program of teaching this book and the DVD with it are amazing resources. Love it through and through. Elder David A. Bednar is a masterful teacher!In this newest book he teaches how we can become more Christlike and how agency really works.He also sets the pattern for effective teaching not only as teachers in church but as parents and even friendships.The enclosed DVD has Elder Bednar answering questions about his book.This book is definitely a MUST read! Another excellent book by Elder Bednar. He further builds upon and develops themes and foundational elements from the first book in this series (“Increase in Learning”). I highly recommend reading the series in the correct order for this reason. This book transitions from focusing on our spiritual learning (the central theme of the first book) to focusing on acting in accordance with our acquired knowledge. It is a natural-feeling progression, which is easy to both follow and understand. I found the links to clips from his Q&A session particularly enlightening and used several of those clips in Sunday School class I teach for one of the local Mormon congregations in my area. This is a fabulous addition to any personal scripture study regimen. Cannot day enough good things about it! I also feel like this second book contains more original content. The first book referenced past presentations, addresses, and articles written by Elder Bednar a bit more heavily, which I understand some readers found frustrating. While he still references older materials, it doesn’t feel like those are the core component of this book. We read this book as a family. We have now completed his collection of three books. It was just as good as the other two, but unique as well. I found this book, as I did the others, to be wonderful teaching tools for my family. We take turns reading the scripture verses, and always have great family discussions. The message of acting in doctrine was powerful. We have a deeper understanding of the power of accountability and taking action. I appreciated the thoroughness of this topic and the themes throughout the book. While the subject matter didn't vary as widely as his others, it was an excellent work. This is another wonderful book by Elder Bednar inspiring action! This is not a book to just read, but to ponder and live and apply and practice and learn for ourselves. It comes with a neat DVD of a discussion with individuals asking Elder Bednar questions about how to best apply the principles and doctrine in their lives. There are some very profound, humble and sweet questions asked, and so much to learn about the pattern of learning and living the gospel and the doctrine of Christ. Learning and acting in doctrine is all about being open to the Spirit and following promptings to learn and work and serve and love, looking outward instead of inward. 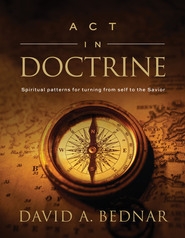 The four chapters in Elder Bednar's book that help us act in doctrine include:1. The Character of Christ2. Moral Agency3. Conversion unto the Lord4. The Role of the TeacherWe must understand the character of Christ and strive to develop Christlike character in our own lives - most importantly forgetting ourselves and looking outward to serve and love others, just as the Savior would. As we understand God's plan, His teachings, agency and covenants we will desire to give our agency or will to God to follow Him more fully. Conversion is more than testimony - it is living what we know to be true. Once we know something we desire to teach and share it. We teach most effectively when we invite others to learn for themselves by the Holy Ghost.There are so many powerful principles and lessons here that I need to go back and study and apply to my specific circumstances and preparation. Here are a few of my favorite quotes that are kind of the essence of the book and message:"A testimony alone is not and will not be enough to protect us in the latter-day storm of evil and religious persecution in which we do now and will yet live (p. 80). ""Whereas a testimony is spiritual knowledge of truth obtained through the power of the Holy Ghost, conversion is deepening devotion to and consistent application of the knowledge we have received. Knowing that the gospel is true is the essence of testimony. Consistently being true to the gospel we know is the essence of conversion (p. 83). ""An answer we discover or obtain through the exercise of faith is typically retained for a lifetime. The most important learnings of life are caught--not taught. The spiritual understanding you and I have been blessed to receive, and which has been confirmed as true in our hearts, simply cannot be given to another person. The tuition of diligence and learning by faith must be paid to obtain and personally 'own' such knowledge. Only in this way can what is known in the mind be transformed into what is felt in the heart. Only in this way can a person move beyond relying upon the spiritual knowledge and experience of others and claim those blessings for himself or herself. Only in this way can we be spiritually prepared for what is coming (p. 127). ""This work is never about me and it is never about you. We need to do all in our power to fulfill our teaching responsibilities and simultaneously 'get out of the way' so the Holy Ghost can perform His sacred work. In fact, anything that you or I do as representatives of the Savior that knowingly and intentionally draws attention to self--in the message we present, in the methods we use, or in our personal demeanor--is a form of priestcraft that inhibits the teaching effectiveness of the Holy Ghost (p. 131). "Elder Bendar gives references to several of his talks for further study, as well as many insightful scriptural and personal examples to consider. I love that this book invites and demands different things of each of us in our own personal spiritual preparation. This book and the accompanying DVD are life-changing as we will apply the patterns and teachings in our lives and act on the individual promptings we receive to continue to learn, turn outward and to the Lord, and ACT in the doctrine we receive. This book reminds me of things I learned in the most recent General Conference and helps me again remember where my priorities should be. There is much to do or keep us busy, but the only really important and lasting priority is learning the doctrine of Christ and acting according to what we learn as prompted by the Spirit. To begin with I would like to say that the accompanying DVD that goes with this book is quite excellent. Watching and listening to Elder Bednar simply answer questions by many times asking a question or guiding the questioner where to find the answer him or herself left me with a desire to hold question-and-answer sessions more often with my children.I absolutely loved Elder Bednar's book "Increase in Learning" and really dove in, writing in the margins, keeping a notebook handy and writing my own questions and answers to questions posed in the book. This book has much the same format but includes blank pages at the end of each chapter with space to write. Some may feel that this is a waste of space, but I love it - I am able to record my thoughts and impressions in the book and keep it as a treasure.Personally I was most inspired by chapter 1: Acting in Doctrine and the Character of Christ. Early in the chapter he writes: "As disciples of the Savior, we are not merely striving to know more; rather, we need to consistently do more of what we know is right and become better. 'If ye know these things, happy are ye if ye do them' (John 13:17). "Elder Bednar then goes on to write about the definition of character and the importance of understanding the true character of the Savior. Many examples were then given of the Savior and others, who, while experiencing difficulty themselves, took the time to reach out to others who were experiencing trials. Chapter four is titled "The Role of a Teacher" and reminds me of much of the material from the his first book. Much is said about discernment; also, that great teaching may not be as complicated as many make it out to be. Repetition is important. Ask questions. Allow for discussion. I love the following statement: "Many of us have learned to teach without conscientiously observing, listening, or discerning. We simply talk and tell. Parents and gospel instructors who talk without observing, listening, and discerning teach neither lessons nor people. Rather, they talk to themselves in front of learners." (Ouch! I know I have been guilty of this. )I look forward to reading this book again and taking time to answer some of the questions I left blank on this reading. I really would give this five stars except that his previous book (which I rated with five stars) has become one of my most cherished books, earning the title of "core" book. So, my goals or stated beliefs are one thing, but my actions indicate something different. How to bring these things into alignment? With this premise/question, (Elder) David Bednar, one of 12 apostles in the Church of Jesus Christ of Latter-Day Saints, sets out to suggest what the reader needs to do in order to resolve this conflict. This is the 2nd in a series of books, beginning with Increase in Learning, this book, and then Power to Become. The book is not considered 'official church doctrine'. The book does come with a DVD containing the results of a Q&A session held with early readers of the book and it is referenced in the sidebar of the chapters.So, with all that intro out of the way, I found this to be a wonderful presentation of the the authors premise on how to resolve the disparity between beliefs and action. I'll admit to a personal bias - I quite enjoy his method or presentation and thought process (to me, very logical, linear/linked ideas - straight line almost?) The only thing I found troubling is that at the end of each chapter are sections/questions working to get the reader to be more involved in the learning process than just passive reading. This basic idea I agree with, but there is a piece entitled 'an invitation to learn and act' - basically asking the reader to consider what more they need to learn, what they will do to learn and then track the progress. My personal issue is that when I first looked at this I was stymied - I had no idea where to go with the request/suggestion. However this may reflect my own 'light'(?) reading of the material - so I do take it as a challenge to pick up on this and try it out more deeply. Given the rest of the material, I think it's a worthwhile exercise! After reading some of these other reviews, I'm thinking that maybe for this to be a five star book, one needs to actually buy it, use it as the study guide and notebook that Elder Bednar intends it to be. There are lots of questions asked and lots of space to write your thoughts and answers. Give this book the time and thought it deserves. Watch the accompanying DVD.I did none of those things. I read it as quickly as I could, in two or three days actually, before I had to return it to the library. I can't help but feel a little bad that I read this book exactly NOT the way the author would have liked. :o) Prepare yourself to have some pondering and journaling time with this book, and maybe you will enjoy it more than I did.There were things that I appreciated here. It had more of personal examples to illustrate what was being taught, and I like that. This book was shorter, because the "related readings" (conference talks, a couple were from BYU devotionals) at the end of the chapters were referenced, not printed in their entirety. As with Increase in Learning, my favorite chapter was the last. It was on how acting in doctrine relates to and can enhance our ability to teach. Applicable to me right now in my Sunday School calling and as a parent. I do wish I had taken down a few notes.I think I did myself a disservice by rushing through this book. This is the second of a three book series, fairly short. I have not read the first book but he gives an overview of it in this book. The third book just came out. The first book was about how we come to KNOW what we should do. This book is about applying that knowledge into ACTION. The third is about how those actions help us BECOME like Jesus.The best part of this book are the links to videos of a Q&A session he held with a group of people who read an advanced copy of the book. We see him interacting with adults and children discussing their needs. Among the advantages of this is that we not only hear him talk about teaching (as in chapter 4) but we see him doing it as an example. I've used those videos in family home evening and in my Church teaching.The most important new idea I learned is about looking out of self. He suggests that one way to measure how close we have come to the Savior is the extent to which we share his ability to forget ourselves and constantly look to others' needs. He provides many beautiful examples of this kind of living to emulate which helped me to see it in new ways. Update: March 2016-This was my pick for our Book Club this year. I enjoyed reading this so much, that I couldn't wait to have a discussion with my "Book Club" ladies. It was even better the second time through. I really need to purchase this book. Read in January 2015: While I was reading the first book, I discovered that Elder Bednar has been talking about this same topic for a long, long time, even before he became a member of the Quorum of the Twelve Apostles in the Church of Jesus Christ of Latter-day Saints. We are agents to act, not merely to be acted upon. This book was as good as the first in this series. I really loved the DVD that accompanies this book. It is great to read a chapter, pause at the appropriate time and watch the DVD section that goes along with what you are reading. Can't wait to read the third book. This book is really good. I requires a quiet corner, and a highlighter. There is an area on each page for your own personal notes. I used my area for thoughts that would pop on my head as I was reading. Questions for myself usually.The accompanying DVD is a great idea. If you are reading the book as an e-read it is perfect. You are reading along and the video that correlates to the subject is right there. You push play and there you go. If you are reading the hard back version you just insert the DVD. I cheated I bought both versions, and would just push play on my tablet when I was at a video, and my notes are all over in the hard version.This book wold help anyone really, but I found it comforting, insightful, and spiritually uplifting for my current calling in church and as a mother, wife and daughter of God. My 4-star rating of this book reflects more my own experience of it than the 5 stars it probably deserves. I checked this out from the library and simply read it. Elder Bednar intends Act in Doctrine to be more of a workbook or study guide to be pondered over a longer period of time. He provides pages of questions with lots of room for writing answers, thoughts, and new questions. He gives additional reading suggestions. There is even a DVD showing him discussing the principles of the book with a sample audience. As the copy I read did not belong to me and had to be returned to the library quickly, I did not take advantage of all the deeper learning that can come from Bednar's teaching. Still, reading alone was a great experience, and I stumbled over multiple gems of wisdom. This book took longer for me to read than Elder Bednar's first book in this series, "Increase in Learning." The first book I devoured in just a few days. This one took more dedicated effort, but maybe that just proves his point, that acting in doctrine requires consistent, diligent effort. I especially loved the chapter on teaching. There are several gems that I hope to remember. Observe, Listen, Discern, then Talk. Good advice for almost any situation or classroom. Learn to get out of the way of the Spirit. It is our job to preach, but the Holy Ghost will teach. We must be careful that we do nothing to distract the focus from the Savior and allow the Spirit to bear witness to truth. I highlighted many passages and wrote notes in the margins. I will refer the this book again and again. I LOVE Elder Bednar's books. Not only are his explanations of things so clear, but this book has a lot more pages specifically for really internalizing what you've been reading. Pages to write thoughts, questions, scriptures, etc. For me this was really effective because it helped me to really think about what I was learning and how I can apply it, which really is the whole point of this book. We need to be living what we believe. I think this is such a simple, yet profound truth that we really need to get deep in our hearts if we really want to follow Jesus Christ's example. I highly recommend studying Elder Bednar's books. Both are excellent. And just like the first book, the companion DVD taught me so much as well. Such a motivating and enlightening book...It opened my eyes to truth and motivated me to act. A focus of this book was to help us bridge the gap between what we know and what we do. Elder Bednar not only teaches, but invites you to act in order to come unto Christ and gain the power and conversion he is talking about. Especially loved the chapter on the character of Christ, and learning to turn outward, as the Savior always did. I feel like the book, along with the awesome dvd it came with, gave me the tools I need to accomplish these great goals. Will definitely be reading his next book, The Power to Become.